Reader Challenge: Find me a funky changing mat! This week we were set a challenge to find her a funky, durable, changing mat.Â So off the BGÂ team went and this is the end result.Â The other options that we looked at will be shared with you at a later stage. 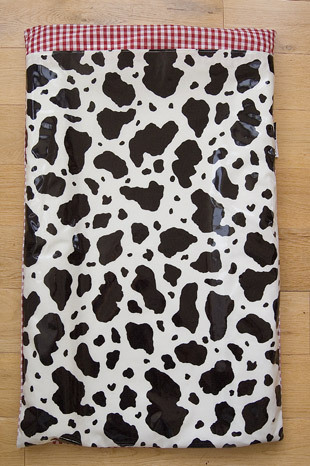 Anyway, I digress.Â Here I found this very funky cow print reversible changing mat by a favourite of ours, ZPM. On one side you have the easy to wipe clean cow print, that is ideal if you have a messy change to make and then if you flip it over, you have the soft and cosy side, in a red gingham material.Â The mat has gently padded sides, which help to prevent your bambino rolling off. We think this works with both sexes and the dimensions are 48cm wide by 80cm height. Available to buy from Babes with Babies for Â£24.95 which includes gift wrapping.